Alpha-H is well known for their wide range of skincare products which help target any major skin concerns. A few weeks ago, I made a wise decision to purchase and trial Alpha-H's Clear Skin range comprising of the Daily Face Wash, Daily Hydrator Gel and Blemish Control Gel. Clear Skin Daily Face Wash is conveniently packaged in a pump bottle with two caps (yes TWO CAPS! ), a smaller clear plastic cap to house the pump top and a larger grey cap, I guess, to prevent air from reaching the gel cleanser. One or two pumps are adequate to cleanse my face AM and again PM. Upon dispensing the product, I immediately noticed the beautiful refreshing herbal scents of Tea Tree and Eucalyptus, which are core ingredients in this gel cleanser. This cleanser is gentle to my skin, thoroughly cleanses my skin and ultimately revitalizes my complexion, making it feel clean and clear of impurities. This cleanser did not leave my skin feeling tight and dry, instead it helped to effectively maintain my skin over a period of time. This cleanser is suitable for combination, oily and blemish prone skin as recommended by Alpha-H.
Moisturising the skin is an important step to help balance and maintain the surface of the skin. Clear Skin Daily Hydrator Gel is enclosed in a squeezable bottle with a flip-top lid, allowing ease to dispense the desired amount of moisturiser. The size of a ten cent coin is perfect for one application AM and again PM. This Hydrator Gel is lightweight and smells refreshing due to the core ingredients of Cotton Seed and Eucalyptus. My skin feels smooth, supple and radiant after continual usage of this moisturizer and I’m quite impressed with the results. My skin is at a better state then before and I’m so glad that I’ve finally found my match! Clear Skin Blemish Control Gel contains wonderful ingredients of Wild Oregano and Tea Tree which help to combat blemishes and keep other blemishes at bay. This gel is formulated with salicylic acid which helps to clear the skin from blemishes and improves the texture of the skin. Salicylic acid also acts to penetrate through the surface of the skin to clear blocked pores. That’s the beauty of Salicylic acid! Over just a few days I’ve noticed a reduction in minor blemishes I end up seeing now and then. The formulation does not dry the affected area, which most products I’ve used do, it actually helped to relieve redness and control those nasty pimples to ensure they disappear within a short amount of time. The Daily Hydrator Gel claims to refine the size of pores, however, I haven’t noticed any reduction in the size of my pores. Possibly requires further use of the moisturizer. The consistency of the Blemish Control Gel was slightly thin for my liking, so I always ended up dispensing more gel than required, which I find quite wasteful for such an effective product. I love the scents of Eucalyptus and Tea Tree in this range and find the core ingredients of herbal extracts are a fantastic concoction to help provide a radiant and clear complexion. My skincare regime from the Alpha-H Clear Skin Range has made a large difference to my complexion and I’m very impressed with the outcome. I highly recommend using these products if you have combination, oily and blemish prone skin. Have you tried any products from Alpha-H?? 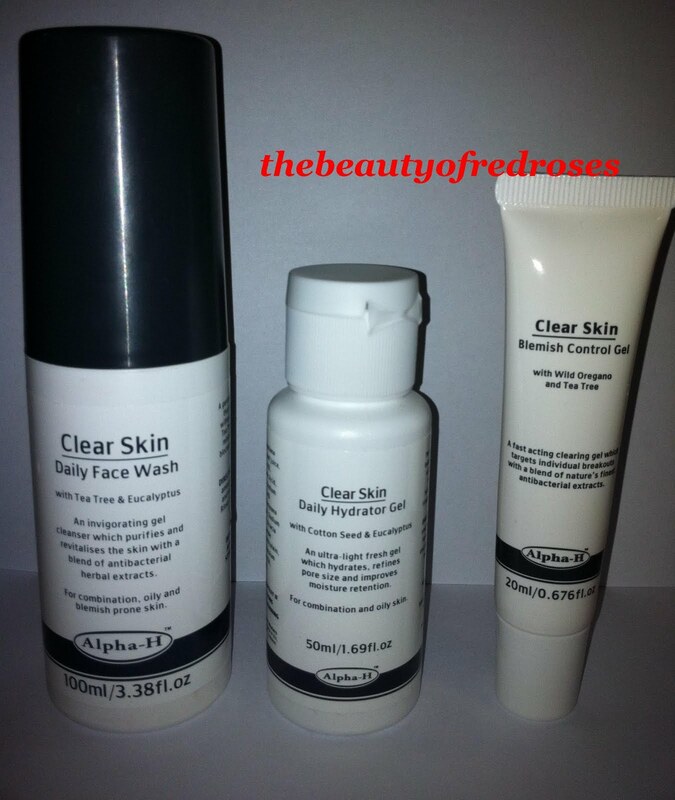 Have you tried the Clear Skin range from Alpha-H?